Tiger Woods has renewed his relationship with Hero MotoCorp and there is a lot of talk about his coming to India for an entire tournament. Tiger Woods may return to India in 2020. 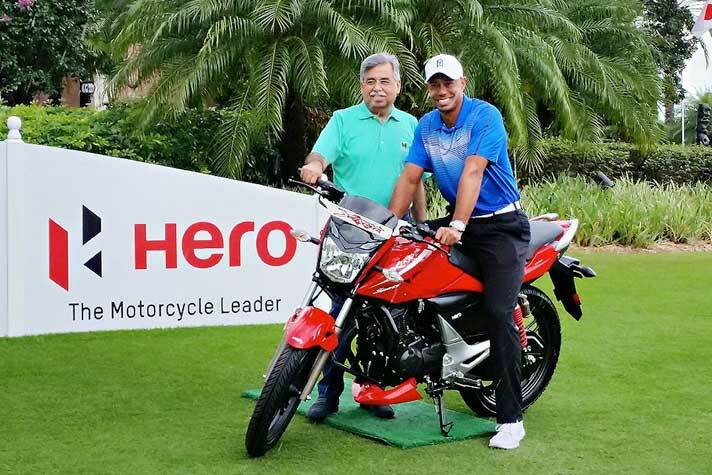 World’s largest manufacturer of motorcycles and scooters Hero MotoCorp said it renewed its ‘global partner deal’ with famous golf player Tiger Woods, which was originally signed in 2014. Hero Motocorp said it will be the title sponsor of the 2018 Hero World Challenge golfing tournament hosted by Tiger Woods that will be played at Albany, Bahamas from Nov. 29 – Dec. 2, 2018. Tiger Woods had slipped into a major slump, both professionally and personally, after marital problems occured in 2009. He was briefly able to rise to No.1 ranking in 2013-14, but was hit by back personal problems soon after and he fell below rank 1000 in 2017. In September 2018, he won his first tournament in five years with a victory at the Tour Championship and moved to #13 in the Official World Golf Rankings. Tiger Woods said Pawan Munjal has a clear vision “for not just the future of global mobility, but also the growth of Golf”. The Hero World Challenge is a four-round, 72-hole stroke play event with a $3.5 million purse and Official World Golf Ranking points. Hero MotoCorp is associated with all the three prestigious tours – the PGA TOUR, the European Tour and the Asian Tour. Besides Golf, it is also a major sponsor in other sports like Soccer, Hockey and Cricket tournaments.